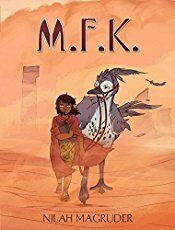 A fantastic adventure following the story of Abbie, a deaf girl with a mysterious power, who is traveling across a vast desert to scatter her mother’s ashes. In a world of sleeping gods, a broken government, and a fragile peace held in the hands of the corrupt, one youth must find the strength to stand up against evil and save humanity. This story is not about that youth. It’s about Abbie, who just wants to get to the mountain range called the Potter’s Spine, scatter her mother’s ashes, and then live out her life in sweet, blissful solitude. Unfortunately, everyone she meets wants to whine at her about their woes, tag along on her quest, arrest her for no reason, or blow her to bits. Journeys are hard on the social recluses of the world. This is a cute little story, but not a whole lot happens here. Abbie is found wandering in the desert, injured, and is taken in by a family in the local town. This town is also targeted by thugs with super powers who basically take what they want, when they want it, because they are clearly superior due to their super powers. Abbie helps the town out with the latest group of thugs, and then decides to continue on with her own journey. And that's about it. Of course, there's a bit more to it, but spoilers! The art has a definite manga feel to it, but sometimes it's a little vague about what's going on. Personally, I wish that there had been a little more substance to the story, as I'm not all that invested in either the characters or where they are going, and this may just be me, but I really wish I at least had a hint as to what the title means, because as far as I could tell, there wasn't any clue anywhere in the book.